This off beat portrait of a hitman trying to retire is a small gem of a film. Khali is a killer who wants to quit. He's finally gotten enough money together to finally go off and become a chef. However fate intervenes when he's carjacked and his money is stolen. Needing some cash to put his grandmother into a good nursing home he agrees to kill the wife and mother in law of a friend in return for a large cash payday, however things don't go as expected. Writer/director Jon Matthews scores big time by taking a well worn story and turning it on its head. Matthews' script isn't concerned with killing, despite the title and is instead focused on the interior landscape of his main character. We are focused purely on Khali and his attempt to fix his life with his ex, his daughter and his grandmother While there is some killing, in the dynamite opening sequence, for the most part this is a blood free affair as our hero finds out that karma is a harsh mistress. 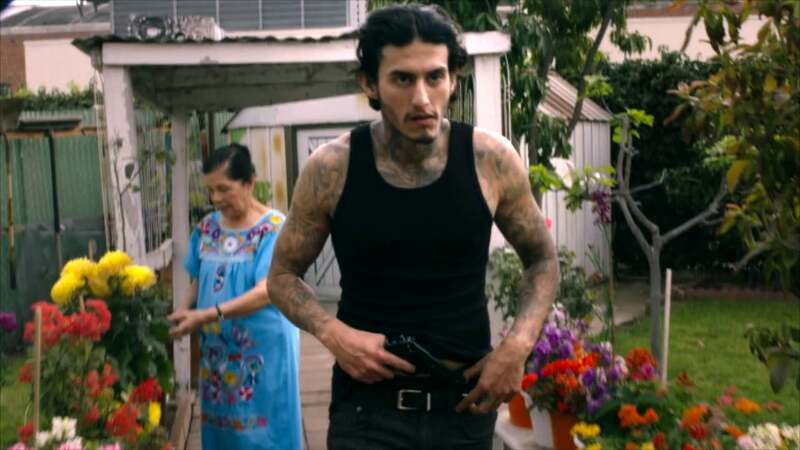 That the film works as well as it does despite having some odd tonal shifts is due entirely to star Richard Cabral who not only makes us like Khali, he makes us believe everything that he is going through. Cabral gives a stunning performance that makes us instantly like his character. There is a sense of depth of emotion always on show, all one has to do is look in his eyes. Cabral is so good that I could see him getting more leads based on this role since he comes across as so damn likable. ...on the other hand those looking for a small gem of a film that goes gloriously its own way will eat up KHALI THE KILLER. wow, great article! Loved the movie, Richard did great! I think this movie will probably please fans 😍😍 can't wait to see another work of experts.. I am a huge fan of the actor, he was awesome in American Crime so I know he can work the character Khali The Killer. The whole story catches my attention and I can't wait to see it! The writer did an amazing job picking the actor and the vison is on point! Saw the trailer and it looks amazing. Can't wait to see the film. I cannot wait to see this film! Freaking amazing!!! I know Richard is going to kill it! No pun intended lol great job guys!!! I have now tried to write three sep posts... I will not back down. These are the films you feel fortunate when you come across. Well done from the top on down. Khali is an intriguing character and the preview is enough to get me excited on a number of different levels. Look forward to getting an “i told you so,” about this movie. Was excited for the trailer....even more excited to see what Khali has in store for us. I love films like this...great storytelling by people that work in movies bc they love it.